The stage is set for the Round 3 of the UCI DH CUP, as we have a close Overall Leaders board, and interesting history to make both the Mens and Womens finals a real nail-biter. On the Mens side of the equation we have Aaron Gwin coming off an insanely fast time and the win at Val Di Sole which moved him into a tie for the Overall points with Greg Minaar. History tells us that Minaar is more than game as a 4 time FORT WILLIAM winner looking for his 5th win and a chance to reclaim the Overall Series lead. But the season is early and anything can happen which is just what Gee Atherton is counting on, after returning from his injury and sitting in 3rd place overall with a strong showing in VDS during round 2. At this point last season Minaar's 4th win fired up the conversation that rest of the season could be a battle for the second overall spot, and we all witnessed Aaron Gwin showing the world that he had other plans. So will it be Minaar, Gwin, or Atherton taking home the win come this weekend? Or will we see someone else step into the spotlight? Danny Hart, Cameron Cole , and quite a few of last years top finishers at FORT WILLIAM are all coming off of strong performances last week at Val Di Sole. Check out the 2011 FORT WILLIAMS MENS RESULTS from last year. On the Womens side of the equation , last years winner Tracy Moseley has been missing in action leaving the rest of the field vying for the crown at FORT WILLIAMS. Rachel Atherton is coming off a strong win at Val Di Sole and has to be excited for this weekend, as she has a history of strong FORT WILLIAM finishes including a 2nd place finish in 2011. Emmeline Ragot currently sits atop the Overall Series Leader board and finished in 7th last year at FW. A course like FORT WILLIAMS will probably also bring a better finish for Tracey Hannah as she looks to remain in the mix with another strong showing in his 2012 campaign. T. Hannah was slowed by the steep loose conditions in at Val Di Sole but is expected to be in contention on course like FORT WILLIAMS. 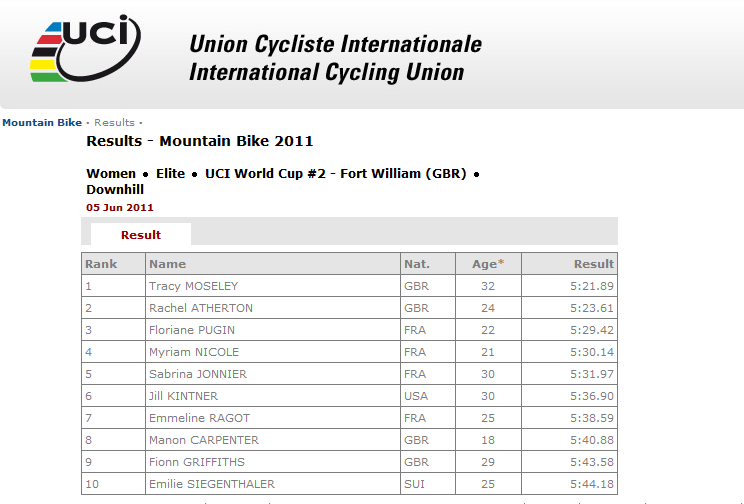 The Womens 2011 FORT WILLIAMS Results (Below) and current standing also show that you can not count Myriam Nicole as she sits 3rd overall even though she was off the pace a bit last year.